We immediately proceeded to block the account of Ms. Kamat and duly informed her about the same within an hour. Then we wrote to her to inquire further about her motive. The person who responded was Ms. Swati Shikhare, whose profile is listed under the faculty section of EPMC’s website. Initially she said that she was preparing for PMP and Ms. Kamat, her colleague, is preparing for CAPM. 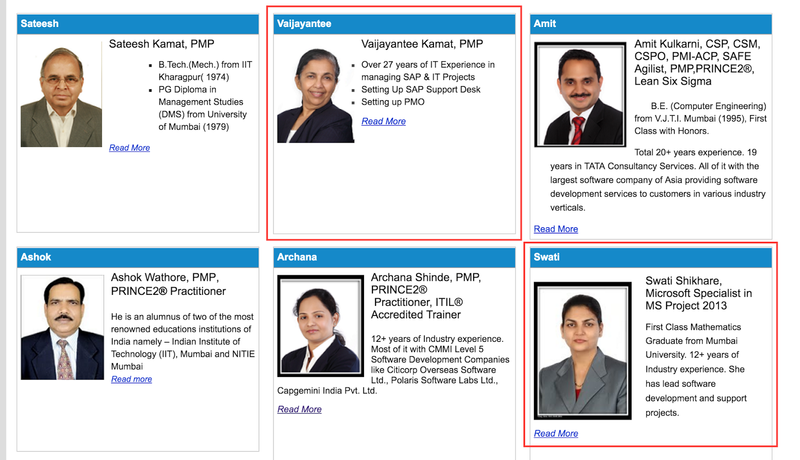 Note that Ms. Kamat is the owner of EPMC and a PMP trainer herself. Then we requested Ms. Shikhare to provide a photo ID for identification. She forwarded us an Indian Government-issued photo ID of Ms. Kamat. When we confronted Ms. Shikhare with evidence that we traced them back to EPMC (with her profile picture on their site), she cooked up a story and said that she’s no longer working for EPMC and that Vaijayantee Sateesh Kamat also happens to be a colleague in her new company. We told her that it’s a nice coincidence that she has two colleagues with the same name in two different companies, and that both of them happen to look very similar (based on the picture on EPMC site and photo ID), and in similar age groups. Moreover, her middle name “Sateesh” on the photo ID happens to match that of the founder of EPMC per their site. This is a clear case of an attempt to steal our Intellectual Property. We have submitted a complaint to PMI and requested them to take stringent action against EPMC. If you happen to be considering EPMC for project management training, please avoid them at all costs. Do not support a company that indulges in IP theft and bases its curriculum on stolen content.